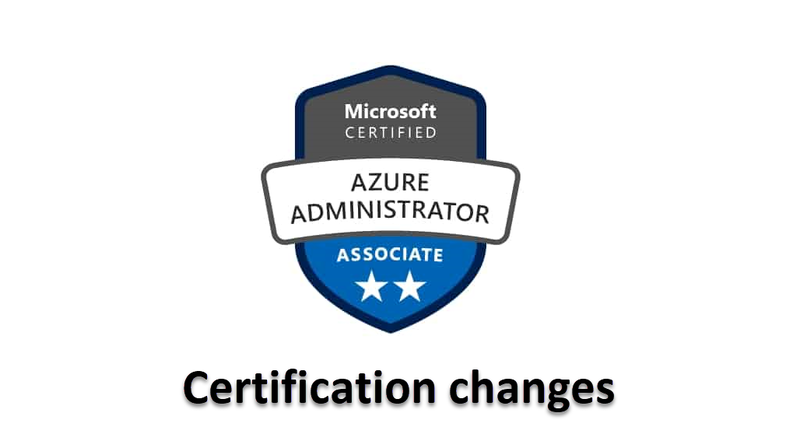 Microsoft Learning just announced changes in the Azure Administrator Associate Certification. In resume the Azure Administrator Associate certification has been modified and now you only need to pass in one exam: AZ-103: Microsoft Azure Administrator. This change will be live starting May 1, 2019. This new exam combines skills from AZ-100 and AZ-101, but basically is all AZ-100 plus some topcis that come from AZ-101. You can find the topics that are coming from AZ-101 at the full object domain in yellow. If you already have the AZ-100 exam, you will get the Azure Administrator Associate certificate. Official Instructor Led and Online Training will be available on May 1, 2019. If you had taken the AZ-101 (with a pass or fail score) you don’t get the Azure Administrator Associate certificate, but you will get the Microsoft Exam voucher. If you have any questions, please do it on the comments section. I will answer to everyone questions on this. Microsoft just announced the public preview of Logic Apps Integration Service Environment. This new service is a fully isolated and dedicated environment for all enterprise-scale integration needs. 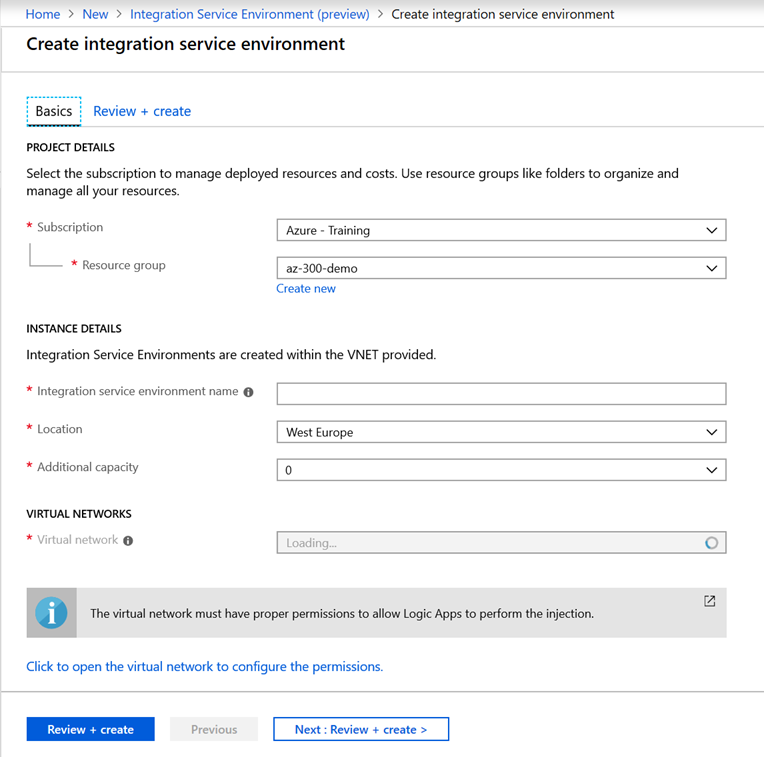 When you create a new Integration Service Environment (ISE), it is created into your Azure Virtual Network, which allows you to deploy Logic Apps as a service on you VNET. This enables your logic apps to have direct access to resources over Site-to-site or ExpressRoute connections. Enables Logic Apps to have secure, direct access to private resources, such as virtual machines, servers, and other services in your virtual network including Azure services with service endpoints and on-premises resources via an Express Route or site to site VPN. Eliminates the noisy neighbor issue, removing fear of intermittent slowdowns that can impact business critical processes with a dedicated runtime where only your Logic Apps execute in. Sensitive data subject to regulation is kept private and secure, opening new integration opportunities. Provides a fixed monthly cost for Logic Apps. Each Integration Service Environment includes the free usage of 1 Standard Integration Account and 1 Enterprise connector. If your Logic Apps action execution count exceeds 50 million action executions per month, the Integration Service Environment could provide better value. Now it’s time to look back and evaluate the year that is ending. 2018 has been amazing! I had the chance to focus a lot on Microsoft Azure project both in the Consulting and Training worlds. I delivered my services in a record number of countries, making me do a lot of flights, 104 flights to be more precise, and yes, I track and log all the flights that I do , all this in 4 different continents! Helping the leadership of a large Cloud project. The biggest budget ever in my career, spanning across 4 years and dozens of millions of Euros. Spoke on several amazing events worldwide and had the privilege to speak for the first time on Microsoft Ignite! For the last few years I had the opportunity to travel across the world, 2019 is just around the corner and I already have several trips scheduled. I will be in a few days in the United States for some cool work (NDA for now…), but I will be in the LA area. Let’s get together if you’re nearby!!! I have amazing community and professional projects to launch in 2019, it will be an amazing and challenging year. 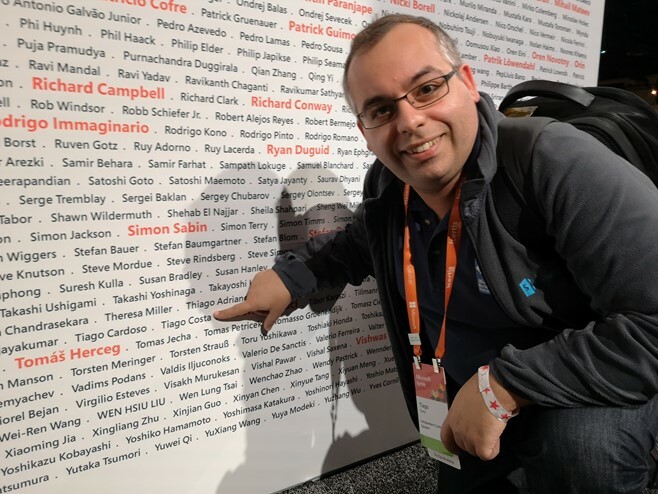 During 2019 I wish to keep pushing Microsoft Azure to more and more customers and IT Professionals! Let’s keep changing the world one IT Professional, one customer at a time! 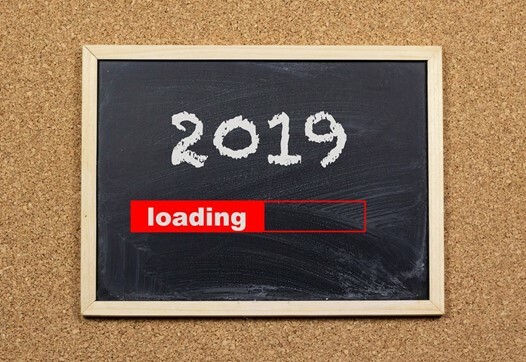 I’m here, and I’m ready for 2019!!! This year I have the honor to speak at ESPC18. 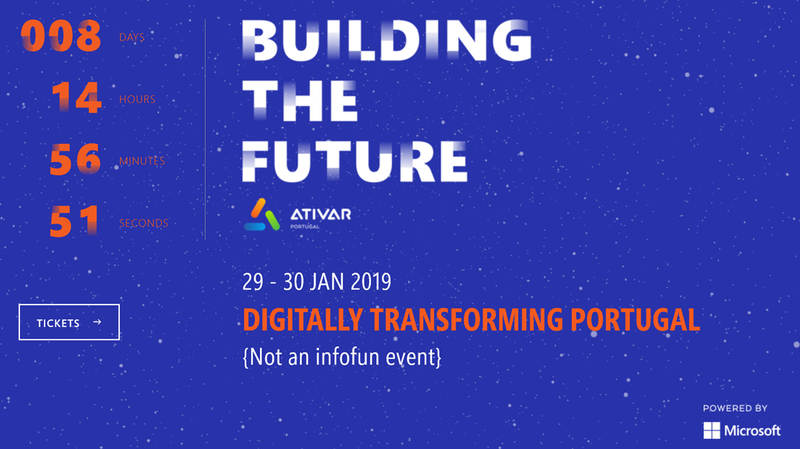 This conference used to be focused on SharePoint, but with the evolving of all the ecosystem around it, now it’s also about Office 365 and Microsoft Azure. Session: Creating a Rocking Global Web Application with Microsoft Azure PaaS Services – Wednesday 28 November, 9AM to 10AM. In this workshop I will talk about the core Microsoft Azure skills that every modern developer needs to have, then we will check some of the main services for Microsoft Azure like: App Services, SQL Database, Azure AD and Storage. We will also check how to create CI/CD pipelines to deploy applications to Microsoft Azure. In this session, we will check how Azure App Service can help us reach a global application goal and how other related services, like Traffic Manager, Azure Storage, SQL Databases and Service Bus can help you. Expect a heavy-demo depended session, based on real-world experience in implementing these services with several customers. Explore the ESPC18 schedule to identify what sessions you’d like to attend. Create your own schedule suited to you. If you are travelling with colleagues, divide and conquer by attending different sessions. Afterwards swap notes to increase your learning. Don’t have time to delve through our 120+ conference schedule? We have created dedicated pages to save you time. Check out the ESPC conference schedule based on IT PRO, DEV, BDM, AZURE or MICROSOFT SESSIONS. Join the ESPC18 App (Login details announced in the coming weeks) & follow the hashtag #ESPC18 to find out whose attending. Why not make your presence known by sending out a tweet introducing yourself? Arrange to meet new individuals at ESPC – you never know what you might discover! Helpful tip: Carry some business cards with you to share with the new people you meet. Before arriving at ESPC, take some time to identify what questions you want answered. Prepare them advance to ask during a session Q&A. Why not take a break from sessions and advance your skills at the ESPC labs or check out the Ask the Experts session? Remember, it’s good practice to note three important key takeaways from each session. With 2,000 delegates expected to attend, ESPC offers a host of exciting day and night experiences. Check out the WOMEN IN TECHNOLOGY LUNCH, a jam-packed EXPO HALL or challenge other delegates and the ESPC team to some fun games in the Community Area. Not enough? Be sure to join the EXPO drinks on Tuesday evening or enjoy a magical night at the sell-out ESPC18 PARTY: A NIGHT AT THE CIRCUS. Schedule a meeting post conference to share your key learnings with your fellow co-workers. Impress colleagues with your advanced knowledge while maximizing value for your company. Share your inspiration and make plans to implement what you learned. Still undecided about attending the leading European SharePoint, Office 365 & Azure Conference? Visit 10 reasons to attend ESPC18 to see why you need to be there. 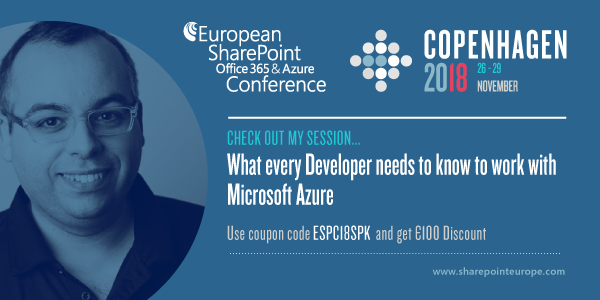 BOOK YOUR TICKET today and use coupon code ESPC18SPK to receive a €100 discount. Hope to see you there!! !